Toor dal is soaked with chana dal or moong dal and is ground into coarse paste along with spices and herbs. The mixture is formed into around 2 inch long cylinders and steamed till well cooked. 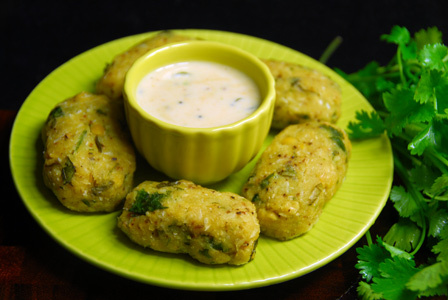 Serve steamed toor dal dumplings with any chuntey. Makes: around 8 – 10 Togari Nuchchina Unde. Soak toor dal, chana dal, moong dal in water for 3 – 4 hours. Refresh in water and strain the soaked dals. Clean, wash and finely chop cilantro and curry leaves. First grind cumin seeds, black peppercorns into powder using a good blender. Then add green chiles, soaked dals, fresh coconut, turmeric powder and salt. Pulse the mixture till its coarsely ground. Don’t add water to the mixture unless extremely necessary. Remove the ground mixture onto a mixing bowl, add curry leaves, cilantro and lemon juice. Adjust any seasonings if required and divide the mixture into around 10 portions. Form each portion into a ball, roll into thick 2 – 3 inch cylinder and lightly flatten the cylinder. Repeat the same with remaining portions. Place all the toor dal dumplings on a steamer and steam for 10 – 15 minutes. Let them stand for around 5 minutes before touching. Serve togari nuchchina unde with dalia coconut chuntey or any chuntey of your choice. Notes: Make sure the toor dal is well cooked before removing from steamer. Suggestions: If toor dal is ground too much, add few tbsps of toor dal in water and coarsely ground with before adding to the other mixture. Making bigger dumplings takes longer to steam. Variations: You can also steam the ground toor dal mixture halfway and then mix with other spices and steam again till done. Other Names: Steamed Toor Dal Dumplings, Togari Nuchchina Unde. 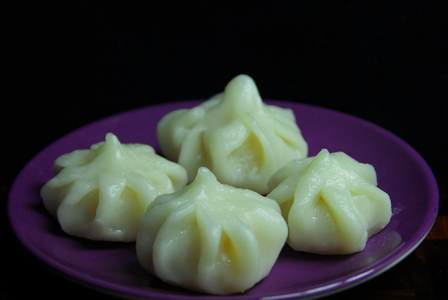 Modak is a sweet dumpling made with rice flour. The stuffing is prepared with freshly grated coconut and jaggery. Both are cooked down along with few condiments till the mixture comes together. The mixture is then stuffed in rice flour dough to form modak. Warm up the ghee and keep aside. Heat a pan on medium heat, add jaggery and a splash of water. Let all the jaggery start to melt, stir in grated coconut and cardamom powder. Let the coconut jaggery mixture cook for few more mintues till the mixture feels sticky to the fingers. Remove the mixture onto a bowl and let it cool completely. Sieve the rice flour and keep aside. Bring to boil a cup of water, add salt, a drop of ghee and rice flour. Remove from heat and mix well with a spatula. Let the rice flour dough cool a bit. Knead the rice flour dough into smooth soft but non sticky dough. Take a lemon sized portion of the rice flour dough and flatten it. Flatten the edges a little more than the middle part. Place the disk on palm of the hand and bring the fingers together to form the disk into a cup. Make pleats more defined and fill the cup with coconut jaggery mixture. Use ghee to grease the fingers if the rice flour tends to stick to them. Bring the top part of cup together carefully and seal it. Repeat the same with remaining rice flour dough. Steam the prepared modak for 8 – 10 minutes depending on the size of the modak. Modak looks shiny and little more transparent when cooked. Let the modak cool a bit before serving with ghee. Notes: Make sure to get the dough right. Suggestions: If the rice flour sticks to the fingers, cook it for few more seconds to let evaporate the moisture a bit. Variations: You can also add saffron, nutmeg or raisins to the coconut jaggery mixture. Other Names: Modak, Ukadiche Modak, Modakulu, Aviri Kudumulu. 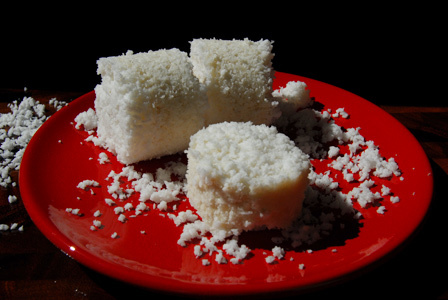 Puttu is a steamed rice cake from Kerala. Here, rice flour is used to make puttu. Traditionally, rice is soaked, dried in open air and then ground into fine powder. The powder is then made wet with water and filled in the puttu kutti (puttu maker). It is then steamed for the rice puttu. Alternatively, steam the rice flour in the regular idly moulds. Makes: around a serving of Rice Puttu. Dissolve around quarter tsp of salt into 3/4th cup of water. Sprinkle water little by little into the rice flour and turn the rice flour into wet powder. Divide the wet rice flour mixture into 3 portions. Fill half of the bottom vessel of the puttu maker with water. Take the cylindrical portion of the puttu maker. Slide the perforated disk into the bottom part of the cylinder. First add a tbsp of the shredded coconut to the cylinder. Then layer it with one third of the rice flour mixture. Add another tbsp of the shredded coconut on top of the rice flour mixture. Repeat the layers two more times starting with the rice flour mixture. Tap the cylindrical portion of the puttu maker couple of times if necessary. Place the top portion of the puttu maker on the bottom vessel and cover with a perforated lid. Place the puttu maker on medium high heat and steam for around 8 minutes. Remove the cylindrical portion and push the perforated disk to slide the puttu onto the plate. Alternatively, fill the idly mould with shredded coconut and then the rice flour mixture. Steam the filled idly tray for 6 – 8 minutes. If possible choose idly moulds that have perforations in them for better steaming. Serve rice puttu with a gravy curry like kadala curry. Notes: Make sure not to make the rice flour into dough by adding more water. Suggestions: Don’t press the rice flour into the cylinder, in which case the steam doesn’t come from the top of the vessel but rather escapes from the bottom of the top part. Variations: You can also mix the shredded coconut into the rice flour, which yields a rather loose puttu. Other Names: Rice Puttu, Rice Flour Puttu, Puttu.